What started as the Occupy Wall Street (OWS) picket in New York at the world’s financial hub has spread across the world, with sit-ins by young people across 900 cities in some 80 countries. That’s an astonishing spread and it is surprising that so little of the OWS movement has been reported in our media—as in the American mainstream newspapers. The people who claim to represent the 99 per cent left out of the system are not getting even one per cent of the attention they deserve. But, perhaps, not so surprising given that India’s mainstream media, too, is also controlled by the very forces that the world’s young people are challenging. In any case, most of the influential editors in this country are votaries of the capitalist system that is being questioned at these extraordinary demonstrations by angry young people who have been marginalised in a deeply scarring way. It is rage, rage and outrage against a system that has left out the poor and deserving (placards say “We are the 99%”) and allowed the elite to make more money through tax breaks, specially bankers and hugely profit-making corporations. Is it primarily capitalism that’s under attack? Basically, the people who are camping at Wall Street and other symbolic spots across the world, such as the European Central Bank in Frankfurt, are protesting the economic injustice that has become the way of life in the developed world. It is about a system that has failed them, leaving them unemployed, homeless and hungry in many cases. The most evocative of the protests is by Los Indignados (The Outraged) in Spain where half a million people, most of them the jobless young, were out on the streets on October 15 seeking a more just and humane society. The indignados have been protesting since the middle of May and it was they who served as the inspiration for OWS. In an interesting interplay of global synergy, the Spaniards say they have drawn new strength and energy from the ongoing OWS protest at Zuccotti Park which is more than a month old! One of the dangers is that the entire movement, chaotic and confused as it may be, could be branded a leftist uprising—such insinuations have been made—and thus push it into a political cul de sac. 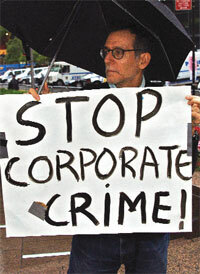 In a sense though, OWS is the result of a brilliant and successful “class war” waged by big business and its allies against ordinary Americans. While the richest Americans won mammoth tax cuts (from 91 per cent in the 1960s to the current 35 per cent), middle class America got no such breaks while having to pay a higher proportion of their income for social security. India is following a similar trajectory. Its budgets have turned increasing pro-business with six successive budgets since 2005-06, writing off corporate income tax amounting to Rs 3,74,937 crore. In the current budget it was Rs 88,263 crore. So far there has been no focus on this aspect in a country where a million mutinies over daily injustices have left little time for such analysis. The outrage of the 99 per cent is spreading though.